It's happened to all of us--you're driving at night, and suddenly your rearview mirror is filled with glaring headlights. Not only is this annoying, but it's dangerous too, as the chances of an accident increase substantially with poor visibility and eye fatigue. 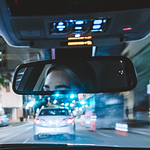 Fortunately, many manufacturers include auto-dimming rearview mirrors in their vehicles, which use sensors and darkens to reduce glare and improve visibility. The darkening process, electrochromism, occurs when two ambient sensors, usually cameras, detect headlight glare from the following vehicle. The sensors then send a signal to a microprocessor, which in turn communicates a charge to an electrified gel to oxidize and make the mirror darker. The darkened mirror gives the driver much better vision and no blind spots, which can happen when exposed to usual headlight glare. Visit Wagner Kia of Shrewsbury today to see what an auto-dimming rearview mirror can do and try it out for yourself!